Synopsis : Many years ago, an extraordinary cripple disappeared from a remote village, ending a time of terror. Not many knew that he gave his life to continue a malevolence, the Sutram, to its subterranean womb or that in doing so, he had prevented the apocalypse. When ace lawyer, Raghuram Surya, received an order of requisition from the Government of India for his ancestral castle, he was unaware of the Sutram beneath it or his own legacy. He will have to choose between the world’s end or his own. Raghuram finds an ally in Sheila, a scientist who is tasked to investigate the Sutram. Using quantum science to interpret a Vedic verse, they will have to unravel the secrets of Creation to stop the destruction. Through it all, they have to be one step ahead of Kiromal just to stay alive. Now is the time of final reckoning. Will Kiromal harness the evil to rule the world? Or will the Sutram break free to eradicate the planet? Or, are Raghuram and Sheila merely pawns in an even deadlier game? My view : Being a hugggeeee fan of mythology / fantasy fiction, I make it an effort to read most books related to this genre and many of these books end up disappointing me. Sometimes, the facts are muddled up, whereas the other times the explanation or the retelling is so childish that they end up mocking the gravity of the mythology they are trying to capture. It is very rare that I find books that please my myth crazy brain. 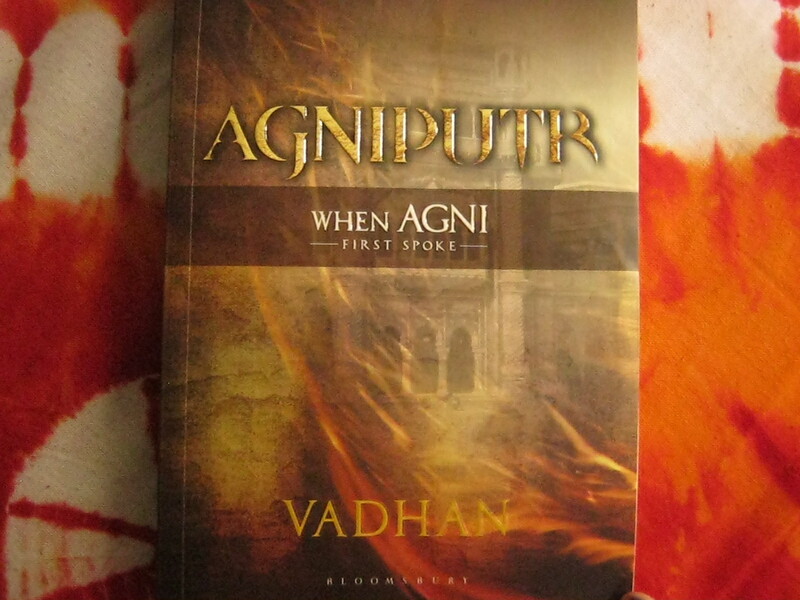 Vadhan’s Agniputr is a book that definitely pleased me. Most importantly the book left me wanting for more. I am slightly disappointed with the author for leaving me hanging in there. I demand a sequel. (Hmmph!) But if you are delving into this book thinking it to be a mythologic fiction, you are going to be proved wrong, my friend. This is not one of those simple retelling of mythologies nor is it just a mere fantasy fiction. It is a book based on complicated quantum science theories that we as literature lovers have always dreaded. This is one of those rare times when I am not going to reveal anything about the plot or the storyline. The blurb is enough of a teaser and I want you guys to be as surprised as me when you gradually explore the thriller. Let it be a delight to your bookish minds. However, I am going to talk about the marvel of a story teller that Vadhan is. His writing capabilities is something I have not come across in contemporary thrillers written by Indian authors in the recent years. He has that uncanny ability to switch to light humour from deep philosophies to scientific theories with the gentle wielding of his pen. His words are power packed and leaves us chilled to the spine with all those supernatural sequences. The book was so unpredictable and awe-inspiring that up to the last word I was astounded. More than a few times, I kept saying to myself “why didn’t I think of that before?” or “how could I miss that?” These are the exact things that we say when a good thriller impacts our mind with a hard blow of suspense and knowledge. The characterization was commendable and the picturesque description of the architecture of various areas of Andhra Pradesh, especially Gudem’s castle was eye-catching. Andhra Pradesh has now occupied the top position in my list of the places I want to visit. I can hardly point out any fault in this book other than a (very) few typing errors. Most importantly, the author’s way of expressing all the difficult theories of quantum science was brilliant. It left thoroughly intrigued and I am sure that I will pick up Stephen Hawking’s book next for a light (yeah, right!) read. That is what Agniputr does to you. It churns your mind’s gears into motion and you feel like you are working as hard as the protagonists to solve the puzzle of finding the syllable to restrain the evil and destroy it. There! I am not telling you anything else about the book. Go read it.